Not sure why your toilet clogs no matter what? 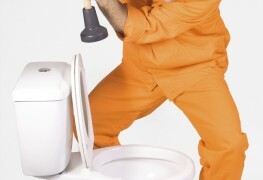 Here’s how to put the plunger down and fix a toilet that clogs all the time. You’re clogging it! By that, we mean you’re putting things into the toilet that have no business being there. Think feminine hygiene products, non-flushable baby wipes, napkins, hair, dental floss, paper towels, diapers and more. Keep these out of the toilet and that may help clear up your chronic clogging issue. You have a low-flow or a dual flush toilet. Low-flow toilets only use half of the amount of water compared to full-flush toilets, and it may be that the toilet can’t take the load it’s being given (human waste or otherwise — see point #1). The flush is likely too weak to handle what’s being doled out to it. A dual flush toilet enables you to flush with more water, usually by holding the handle down a bit longer. Test if you have a dual flush toilet, and if not, try making smaller, er, deposits per flush. Your flapper needs fixing. The flapper is the round device that sits inside your tank and controls the flush of your toilet. If the flapper in your toilet is broken, it may be malfunctioning by closing too soon and reducing the power of your flush. Lift up the tank lid, flush the toilet and watch the device inside the tank move — you should see 3/4of the tank’s water drain before it closes. If it’s closing too early, replace it. Your holes are blocked. Namely the port holes, which are located right under the edge or rim of your toilet. Take a handheld mirror and hold it inside the toilet, angling the mirror until you see the two holes. 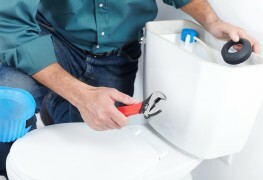 If they look clogged because of hard water deposits, debris or anything else, take a small, sharp tool or even a wire hanger and poke through the holes, scraping them off. 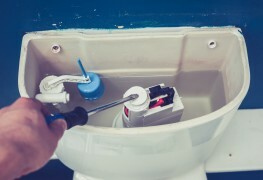 Follow by pouring a combination of muriatic acid water (one part acid to 10 parts water) into the toilet’s overflow tube inside the tank and give the toilet a flush again to see if that did the trick. Your tank is empty. Take a peek inside the tank — is the water up to the fill line? If not, adjust the float so more water comes in. Your drain line is clogged. There could be a backup in the drain line that’s causing your constant clogging. Have a look at other lines and drains in your house (such as the washing machine) to see if they’re clogged as well. If so, you’ll need to call in a plumber for help.